Madison Claire “Maddy” Lambert, 9, entered the gates of Heaven on January 8, 2013. She passed peacefully at home surrounded by her loving family after a courageous three year battle with leukemia. Maddy was born on July 9, 2003, in Defiance, Ohio, to Russell and Dorothy (Barnard) Lambert. She was a fourth grader at Archbold Elementary where she enjoyed her school work and being around her friends. Maddy also enjoyed watching Animal Planet and Food Network, playing Barbies with her sister, swimming, doing arts and crafts, and playing with her pets. She especially loved hearing stories from family and friends- real stories about when we were growing up, funny events, and any adventures with animals. Throughout her three year battle with leukemia, Maddy never lost faith and never complained. She faced each new hurdle with courage and strength and with her famous smile that could light up a room. She always gave of herself in order to help others and pay forward all the generosity that she was shown. She was an active participant in the ABC 4 Maddy Relay for Life team and served as the 2011 Fulton County Relay for Life Jr. Honorary Chair. She also enjoyed attending numerous other events promoting childhood cancer awareness. With Maddy’s passing, we remind others that her life is one to be celebrated. Although we will miss her everyday, especially her famous smile, she will forever remain in our hearts. Through her teachings about life, we were able to create wonderful memories and it has been a privilege to be her parents. In addition to her parents, Maddy is survived by her loving sister, Julia; grandparents, Robert and Louise Lambert of Ney and Daniel and Gilda Barnard of Bryan; aunts, Deb (David) Stephens of Findlay, Alicia (Brian) Laffin of Brunswick, Amanda (DJ) Curry of Ney, Anna (Tyson) Mock of Bryan; uncles, Kevin Barnard of Fayette, Robert (Stacy) Lambert II of Ney, Corey (Dawn) Lambert of Bryan; great-grandfather, Kenneth Harmon of Bryan; and 15 cousins. She was preceded in death by her great grandparents, Erma Harmon, Anthony and Josephine Forgione, Albert and Dorothy Lambert, and Robert and Ocie Shock. 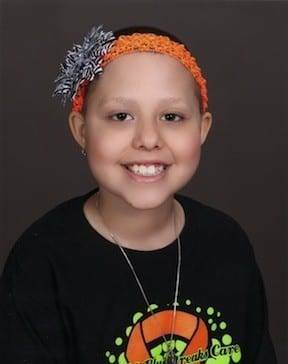 Our family wishes to thank the entire community for the overwhelming support that we have received during the years that Maddy was fighting her illness. We are also grateful for the entire staff of St. Vincent Mercy Children’s Hospital. Their compassion and kindness gave us strength and hope during those long difficult times when we were away from home. A Celebration of Maddy’s Life will be held at 11:00 A.M. Saturday, January 12, 2013 at the Archbold High School, with the Rev. Father Marty Nassr, officiating. There will be a private family funeral service and burial in the Archbold Cemetery. Visitation will be held in Founder’s Hall at Sauder Village in Archbold on Wednesday from 6:00 P.M. until 8:00 P.M. and also on Thursday from 2:00 P.M. until 8:00 P.M. The family requests that memorial contributions be given to Cure Search, ABC 4 Maddy Relay for Life, Conquer Childhood Cancer Now, or Make-A-Wish of Northwest Ohio. Online condolences may be offered to the family at www.grisierfh.com. Grisier Funeral Home in Archbold has been entrusted with arrangements. © 2013, The Village Reporter and/or The Associated Press. All rights reserved. Be the first to comment on "Madison Claire “Maddy” Lambert (2003-2013)"